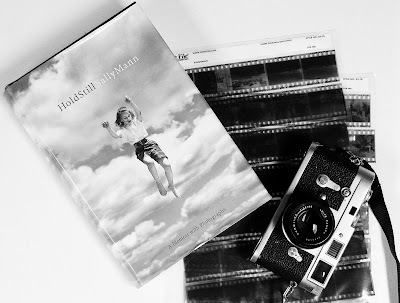 Random Camera Blog: Sally Mann's Hold Still. Hold Still, A Memoir with Photographs by Sally Mann has to be one of the most engrossing books by a photographer that I have read. Published this year (2015), it is an intimate autobiography by one of America's celebrated photographers. Sally Mann not only delves into her own history, but to the history of both parents' families, her life as a child, adolescent, angsty and rebellious teenager, adult, mother, and photographer, and the events that shaped her. She forged a path of her own, and credits photography and the love of her life as two things that saved her from becoming a talented, possibly aimless woman trying to find herself. Reading this book, I felt as though I were in an extended conversation with her, as events and people and photography are weaved into a compelling and intimate narrative that is so much better than having someone write a biography about a person after his/her death. There is an all-encompassing thread of death in the book, but it's not a put-off. In the grand circle of things, death is part of life, and our culture in America has put death out there as some sort of aberration, when in fact, it is not. I think Sally manages to imbue death with a life of its own in this book, and while yes, there is finality in it, life still goes on. That is just one aspect of this rewarding book. As a photographer, I want to know what motivates people to shoot, and what influenced them in their careers. A third aspect comes to the fore here as well, and that is her love of the Virginia countryside, especially the mountains, where she grew up. It's the land and the light that moves her. and I get exactly what she's saying. Yes, she does describe some of her work as a photographer, as well as the fallout about her photography that used her children as subjects. It's very interesting, and thought-provoking. The fourth aspect of the book that stands out, is the dichotomy and interlacing of black and white cultures in the South. Sally contrasts the beauty of the South, and the ugly truth of apartheid that has permeated the history there. Sally writes, after finding a nondescript burial in the fields of Mississippi: "Out in the middle of nowhere, I contemplated this paradoxical scene so emblematic of the plucky, undiminished South, a no-frills monument to the intractability of the overworked soil and the practical, impoverished, generous people who have long tried to wring a living from it." This is a complex book, focusing on her family history, her personal history, finding photography, living as an artist, finding love, finding beauty, and some timeless truths about love, art, redemption, and the continuum of life. If Sally Mann had never taken a photograph, we would have been poorer for it, but she's equally skilled as a storyteller, and Hold Still will have a hold on you. Hold Still. A Memoir With Photographs by Sally Mann. 2015. Little, Brown and Company. 482 pp. ISBN 978-0-316-24776-4. I should add, after all this, that Sally Mann came to Ann Arbor in 2012 and spoke as part of the Penny W. Stamps School of Art and Design's lecture series. 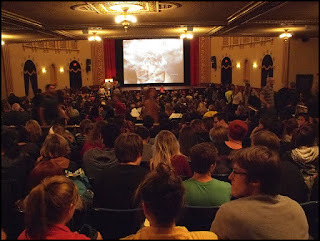 She was fantastic, and some of the content in Hold Still was part of her lecture. Thanks for the lovely book review. I will be sure to check out the book.